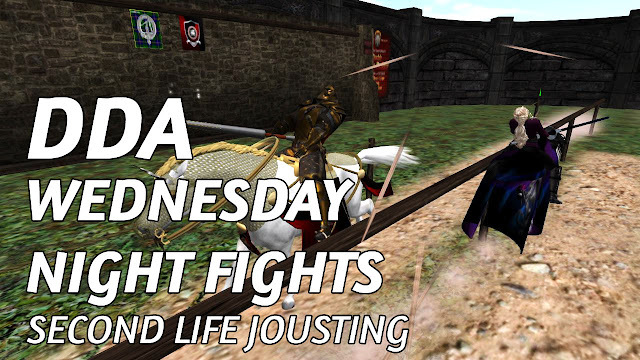 SECOND LIFE JOUSTING • DDA WEDNESDAY NIGHT FIGHTS (11/21/2018) - KABALYERO - PLAY, BLOG & EARN! DDA Wednesday Night Fights is an open Second Life Jousting tournament in Second Life hosted by the Academy of Double Dragons every Wednesday. For this particular DDA Wednesday Night Fights, the participants were Rachel Windsong, Aaron Caine, Brett VonKjeller and Kali. To find out who won and became the Tournament Champion, just watch the entire video of the tournament. The list used in this Second Life Jousting Tournament was the Dragon List by Dragon Lance Design. Jousting Lance used was the Dragon Jousting Lance. Also, there is a special dance number by the participants at the end of the video. Enjoy!